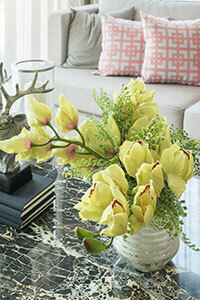 Look for items in your home that could serve another purpose if moved to a different room. For example, a small table used as a nightstand in the bedroom will look very differently used as an end table in the living room. Adding natural elements to your rooms—that is, wood, rattan, metal, and cloth—in different colors and textures creates a feast for the eyes. Add shelving or wall hangings for artwork, sculptures, crafts, collections, or any other items that you enjoy that tell viewers this home is a special place to you. Small touches of color provide depth and interest to decorating, inviting the eye to wander around the room and enjoy the variations. Use this tactic to add bright colors here and there around your rooms. Let small corners of the room be the places that offer visual surprises. Add something oversized to your rooms. A large painting you love can dominate the room and make a unique statement. A special, large piece of furniture can provide visual impact and an instant story to tell your guests. Place a large sculpture or plant in the room to create a feeling of drama.